The box-office take for this year's just concluded week-long National Day holiday experienced a significant decline over last year, according to estimates on Sunday. The decline was apparent straight from the start as the holiday's first day box-office total on September 30 reached only 252 million yuan ($36.69 million), an 11 percent year-on-year drop from 2017's 283 million yuan. The decline continued from there. From September 30 to October 7, movies earned an estimated 2 billion yuan at the Chinese mainland box office, a year-on-year decline of 31 percent from 2017's 2.93 billion yuan. While last year's National Day box office (September 30 - October 8) did receive a boost since the holiday was one day longer due to a coincidental collision with the traditional Mid-Autumn Festival, looking at the 2017 box office for the period of September 30 to October 7, movies still managed to bring in 2.7 billion yuan. 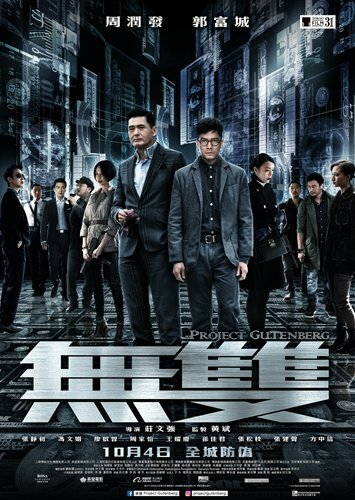 The biggest winner among the 11 films that competed over the holiday period was mainland-Hong Kong co-production Project Gutenberg, which earned an estimated 670 million yuan. Starring Hong Kong stars Chow Yun Fat and Aaron Kwok and directed by Hong Kong director Felix Chong, the film tells the story of a painter (Kwok) who cooperates with criminals to launch a world-wide counterfeiting operation. Seen by many critics as the holiday's "dark horse" contender, the film surpassed the highly anticipated comedy film Hello, Mrs. Money and Zhang Yimou's Shadow to reach the top spot by its third day. Bona Film Group's third crime co-production with a Hong Kong studio to make a big splash during the holiday following 2016's Operation Mekong and 2017's Chasing The Dragon, Project Gutenberg is being called "one of the best Hong Kong-style crime thrillers of recent years" by many mainland moviegoers. Originally predicted by Maoyan, one of China's biggest ticketing platforms, to earn around 2 billion yuan over the holiday, Mahua FunAge's Hello, Mrs. Money failed to live up to expectations, earning only an estimated 520 million yuan to reach second place. Following the misadventures of impoverished man Li Cha, his friends and his super rich aunt, the film is an adaptation of the studio's same-named stage drama. Though the film can still be considered as performing relatively well compared to the competition, it is hardly impressive when taking the studio's previous works released during National Day holiday into consideration. The studio's Goodbye Mr. Loser and Never Say Die collected 1.4 billion yuan and 2.2 billion yuan respectively when released in 2015 and 2017. Coming in third was Zhang Yimou's period film Shadow. Receiving critical acclaim at overseas film festivals and a 7.5/10 rating on Chinese review platform Douban - a relatively high rating when it comes to the renowned director's works - the film about a king's body double searching for a life of his own has pulled in an estimated 461 million yuan. Some critics have blamed the lackluster performance of comedy films for this year's decline. "Comedy films are Chinese audience's go-to choice during holidays and so are far more likely to become hits, but this year's Hello, Mrs. Money and Fat Buddies were not received well," Hu Jianli, editor-in-chief of film and TV news platform Yingshi Fengxiaobiao, wrote on Sunday. Another factor behind the holiday box-office decline could be rumored policies concerning movie ticket pricing. According to industry rumors that began circulating in the middle of September, government authorities were planning to implement a ban on movie ticket subsidies on online ticketing platforms starting on October 1. "This means that previous low-priced tickets such as tickets costing 9.9 yuan or 19.9 yuan - the result of cooperation between producers and online ticketing platforms - will never be seen again on online platforms," China Movie Report, a China Central Television movie program, posted on Sina Weibo in mid-September. "The ban might make more price-sensitive moviegoers choose not to go to cinemas… without the impetus of cheap ticket prices, word of mouth will become a more important factor in deciding a film's box-office performance," wrote an article on Chinese finance data platform Wind on Friday. As to whether these rumored changes have actually been implemented, no official statement has been issued from authorities. However, complaints about high ticket prices have been trending on Chinese social media platforms.